See the full schedule for The Maybe Trains Tour! Fortunately, he chances upon the outspoken Tess McKinnon. To earn her trust, he must first convince her that he is neither a lunatic nor a liar. The proof he needs is buried at the end of a mountain road, where the ruins of Greendale lie just beneath a layer of dead leaves and moss. What became of his home? Why is there no record of its existence? Rodney Jones gives readers a taste of 1875 in Vermont. John Bartley lives with his aunt and uncle in the small town of Greendale, where children mind their elders and everyone has a place and responsibility. A routine to Rutland goes awry when on John’s way home the scenery evolves and he finds himself in 2009 Vermont. The Sun, the Moon, and Maybe the Trains is a light genre mix of science and historical fiction that readers will quickly enjoy. There’s even a hint of romance to keep readers engaged. John Bartley has a unique voice, as do most of the characters, but his personality didn’t excite me or keep me interested in his thoughts or feelings. He’s such a consistent character in temperament and attitude that he seems too perfect and unreal. His story is no doubt interesting; finding himself in a familiar place at a different time has to be a confounding experience. I favored his time spent in 2009 because his reactions were humorous, especially when Tess is introduced into the story. If the story centered more on his experience in the modern version of Vermont, I would have enjoyed a big percentage more than I already did. Tess, a secondary character, actually becomes very essential to the plot. John and Tess’ friendship was very sweet to read about and readers will root for them in their adventure. Jones gets you thinking about the possibilities of time travel. Usually, time travel raises thoughts about the implications of how every action could change the past or future, but here Jones answers the simple question of what would happen if time travel happened unexpectedly? After his trip to the future, there’s even a point where John must decide how to save his town from a disastrous outcome. 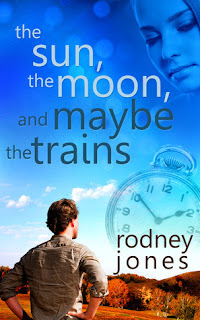 I believe The Sun, the Moon, and Maybe the Trains is the kind of story that will give each reader something different to latch on to and contemplate, but overall will definitely enjoy. The plot isn’t at all predictable and the buildup of tension leading to the conclusion of the story really incites great emotion. But the nervous flutters and racing heart won’t dim your appreciation as The Sun, the Moon, and Maybe the Trains ends on a note of good-naturedness and a surprise twist.